The weather was unseasonably rainy and chilly during the two weeks I spent in Burgundy this past June, so when sunshine arrived one Saturday morning there was only one place to go for lunch. The Bistro de l’Hôtel. The small, intimate dining room can feel quite formal during the fall and winter, but the ambience is decidedly more laid back during the summer, especially if you can get one of the outside tables. Our lunch was fabulous from start to finish. Roederer is one of my go-to Champagnes. It was a real pleasure to drink – not taste – a glass of the NV Brut Premier to start off this delicious lunch. 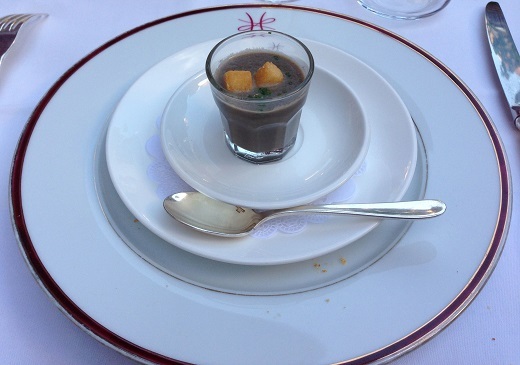 The mushroom soup starter was perfect and a great match to the warm, nutty nuances of the Champagne. Sometimes simple is best, and that was certainly the case here. I couldn’t resist the white asparagus, which were the last of the season. 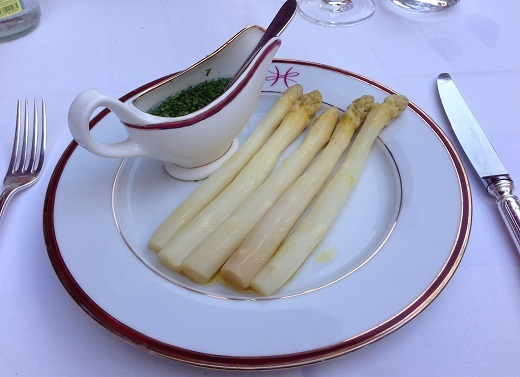 Served with vinaigrette, the asparagus were delicious, and also a nice break from the heavy cuisine that is so typical of Burgundy. What do drink? Well, that is never easy, as the Bistro’s list is vast. Lucien Le Moine’s 2010 Meursault 1er Cru Genevrières turned out to be spectacular. The wine really should have been decanted, as it needed several hours to open up, but what a wine! Rich, explosive and layered, the 2010 burst out of the glass with a head spinning mélange of exotic aromas and flavors. The intense Genevrières minerality actually worked beautifully with the asparagus. Now I know what pairs well with one of the greatest enemies of wine at the dinner table. Too bad Genevrières isn't the kind of everyday wine one can drink whenever the mood strikes! One of the things I love most about the food at the Bistro is that it is relatively light by Burgundian standards. There are more than a few Italian influences here. 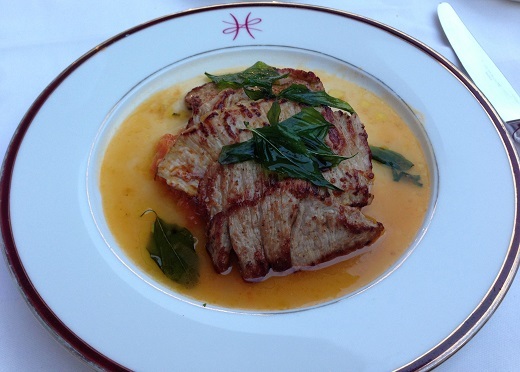 That was evident in the veal scaloppini, a dish that captured the best of both the French and Italian kitchens. It was the perfect dish for lunch on a warm summer day. Tomatoes, basil and a host of bright flavors literally jumped off the plate. 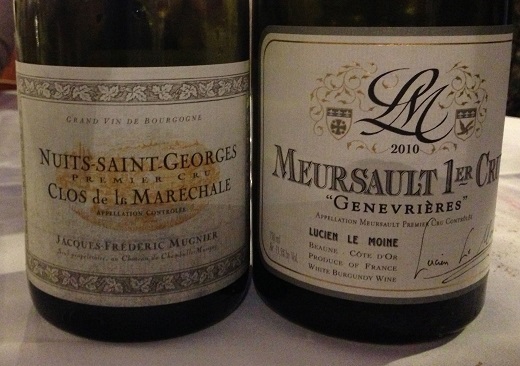 Mugnier’s 2009 Nuits-Saint-Georges Clos de la Marechale was drop-dead gorgeous. Clos de la Marechale is another of my go-to wines, as it is readily available (by Burgundian standards) and rarely excessively marked up on restaurant lists. The 2009 was ripe, open and seductive. Although very much in the style of the year, the Clos de la Marechale also showed plenty of structure in support of the radiant, expressive fruit. Readers fortunate enough to own the 2009 can look forward to a broad and long drinking window.